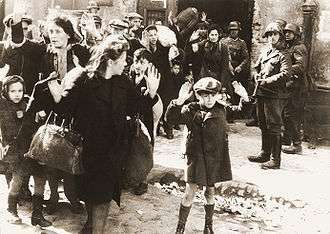 In this famous image from the Warsaw Ghetto Uprising, Josef Blösche (far right) and other Nazi soldiers gather up Jewish people for persecution. Dehumanization or an act thereof can describe a behavior or process that undermines individuality of and in others. Behaviorally, dehumanization describes a disposition towards others that debases the others' individuality as either an "individual" species or an "individual" object, e.g. someone who acts inhumanely towards humans. As a process, it may be understood as the opposite of personification, a figure of speech in which inanimate objects or abstractions are endowed with human qualities; dehumanization then is the disendowment of these same qualities or a reduction to abstraction. e.g. Technology revolutions cause the dehumanization of labor markets to the point of antiquation. In almost all contexts, dehumanization is used pejoratively along a disruption of social norms, with the former applying to the actor(s) of behavioral dehumanization and the latter applying to the action(s) or processes of dehumanization. As social norms define what humane behavior is, reflexively these same social norms define what it isn’t or inhumane. Dehumanization differs from inhumane behaviors or processes in its breadth to include the emergence of new competing social norms. This emergence then is the action of dehumanization until the old norms lose out to the competing new norms, which will then redefine the action of dehumanization. If the new norms lose acceptance then the action remains one of dehumanization and its severity is comparative to past examples throughout history. However, dehumanization's definition remains in a reflexive state of a type-token ambiguity relative to both scales individual and societal. Biologically, dehumanization can be describe as an introduced species marginalizing the human species or an introduced person/process that debases other persons inhumanely. In Nick Haslam's review of dehumanization, he differentiates between uniquely human (UH) characteristics, which distinguish humans from other animals, and human nature (HN), characteristics that are typical of or central to human beings. His model suggests that different types of dehumanization arise from the denial of one sense of humanness or the other. Language, higher order cognition, refined emotions, civility, and morality are uniquely human characteristics (i.e., traits humans have that non-human animals do not). Cognitive flexibility, emotionality, vital agency, and warmth are central to human nature. Characteristics of human nature are perceived to be widely shared among groups (i.e., every human has these traits), while uniquely human characteristics (e.g., civility, morality) are thought to vary between groups. According to Haslam, the animalistic form of dehumanization occurs when uniquely human characteristics (e.g., refinement, moral sensibility) are denied to an outgroup. People that suffer animalistic dehumanization are seen as amoral, unintelligent, and lacking self-control, and they are likened to animals. This has happened to Jewish people during The Holocaust, and the Tutsi ethnic group during the Rwandan Genocide. While usually employed on an intergroup basis, animalistic dehumanization can occur on an interpersonal basis as well. Moral exclusion occurs when outgroups are subject to a different set of moral values, rules, and fairness than are used in social relations with ingroup members. When individuals dehumanize others, they no longer experience distress when they treat them poorly. Moral exclusion is used to explain extreme behaviors like genocide, harsh immigration policies, and eugenics, but can also happen on a more regular, everyday discriminatory level. In laboratory studies, people who are portrayed as lacking human qualities have been found to be treated in a particularly harsh and violent manner. Martha Nussbaum (1999) identified seven components of objectification: "instrumentality", "ownership", "denial of autonomy", "inertness", "fungibility", "violability", and "denial of subjectivity". Sociologists and historians often view dehumanization as central to war. Governments sometimes represent "enemy" civilians or soldiers as less than human so that voters will be more likely to support a war they may otherwise consider mass murder. Dictatorships use the same process to prevent opposition by citizens. Such efforts often depend on preexisting racist, sectarian, or otherwise biased beliefs, which governments play upon through various types of media, presenting "enemies" as barbaric, as undeserving of rights, and as threats to the nation. Alternatively, states sometimes present an enemy government or way of life as barbaric and its citizens as childlike and incapable of managing their own affairs. Such arguments have been used as a pretext for colonialism. The Holocaust during World War II and the Rwandan Genocide have both been cited as atrocities predicated upon government-organized campaigns of dehumanization, while crimes like lynching (especially in the United States) are often thought of as the result of popular bigotry and government apathy. Dehumanization can be seen outside of overtly violent conflicts, as in political debates where opponents are presented as collectively stupid or inherently evil. Such "good-versus-evil" claims help end substantive debate (see also thought-terminating cliché). In the United States of America, Americans of African ancestry were dehumanised via the classification of being deemed as a primate, not a human. The United States of America Constitution that took place in 1787 stated when collecting census data “all other persons” in reference to enslaved Africans will be counted as three-fifths of a human being. In the 1990s reportedly California State Police classified incidents involving young men of African ancestry as no humans involved. A California police officer who was also involved in the Rodney King beating described a dispute between an American couple with African ancestry as “something right out of gorillas in the mist.” Franz Boas and Charles Darwin hypothesized that there may be an evolution process among primates. Monkeys and apes were least evolved, then savage and/ or deformed anthropoids which referred to people of African ancestry, to Caucasians as most evolved. Relatively recent history has seen the relationship between dehumanization and science result in unethical scientific research. The Tuskegee syphilis experiment and the Nazi human experimentation on Jewish people are two such examples. In the former, Africans Americans with syphilis were recruited to participate in a study about the course of the disease. Even when treatment and a cure were eventually developed, they were withheld from the Black participants so that researchers could continue their study. Similarly, Nazi scientists conducted horrific experiments on Jewish people during the Holocaust. Dehumanization of these groups justified the research. When this research came to light, efforts were made to protect participants of future research, and currently institutional review boards exist to safeguard individuals from being taken advantage of by scientists. Democracy and "dignity of man"
Dehumanization and dehumanized perception can occur as a result of language used to describe groups of people. Words such as migrant, immigrant, and expatriate are assigned to foreigners based on their social status and wealth, rather than ability, achievements, and political alignment. Expatriate has been found to be a word to describe the privileged, often caucasian people newly residing in an area and has connotations which suggest ability, wealth, and trust. Meanwhile, the word immigrant is used to describe people coming to a new area to reside and infers a much less desirable meaning. Further, "immigrant" is a word that can be paired with "illegal", which harbours a deeply negative connotation to those projecting social cognition towards the other. The misuse and perpetual misuse of these words used to describe the other in the English language can alter the perception of a group in a derogatory way. "Most of the time when we hear [illegal immigrant] used, most of the time the shorter version 'illegals' is being used as a noun, which implies that a human being is perpetually illegal. There is no other classification that I’m aware of where the individual is being rendered as illegal as opposed to the actions of that individuals." 1 2 3 4 5 Haslam, Nick (2006). "Dehumanization: An Integrative Review" (PDF). Personality and Social Psychology Review. 10 (3): 252–264. doi:10.1207/s15327957pspr1003_4. PMID 16859440. ↑ Haslam, Nick; Kashima, Yoshihisa; Loughnan, Stephen; Shi, Junqi; Suitner, Caterina (2008). "Subhuman, Inhuman, and Superhuman: Contrasting Humans with Nonhumans in Three Cultures". Social Cognition. 26 (2): 248–258. doi:10.1521/soco.2008.26.2.248. 1 2 3 Leyens, Jacques-Philippe; Paladino, Paola M.; Rodriguez-Torres, Ramon; Vaes, Jeroen; Demoulin, Stephanie; Rodriguez-Perez, Armando; Gaunt, Ruth (2000). "The Emotional Side of Prejudice: The Attribution of Secondary Emotions to Ingroups and Outgroups" (PDF). Personality and Social Psychology Review. 4 (2): 186–197. doi:10.1207/S15327957PSPR0402_06. 1 2 Bar-Tal, D. (1989). "Delegitimization: The extreme case of stereotyping and prejudice". In D. Bar-Tal, C. Graumann, A. Kruglanski, & W. Stroebe (Eds. ), Stereotyping and prejudice: Changing conceptions. New York, NY: Springer. 1 2 Opotow, Susan (1990). "Moral Exclusion and Injustice: An Introduction". Journal of Social Issues. 46 (1): 1–20. doi:10.1111/j.1540-4560.1990.tb00268.x. ↑ Goof, Phillip; Eberhardt, Jennifer; Williams, Melissa; Jackson, Matthew (2008). "Not yet human: implicit knowledge, historical dehumanization, and contemporary consequences" (PDF). Journal of Personality and Social Psychology. American Psychology Association. 94 (2): 292–306. doi:10.1037/0022-3514.94.2.292. PMID 18211178. Retrieved 7 May 2016. ↑ Livingstone Smith, David (2011). Less Than Human: Why We Demean, Enslave, and Exterminate Others. St. Martin’s Press,. p. 336. ↑ Eibl-Eibisfeldt, Irenäus (1979). The Biology of Peace and War: Men, Animals and Aggression. New York Viking Press. ↑ Grossman, Dave Lt. Col. (1996). On Killing: The Psychological Cost of Learning to Kill in War and Society. Back Bay Books. ISBN 0-316-33000-0. ↑ Bandura, Albert (2002). "Selective Moral Disengagement in the Exercise of Moral Agency" (PDF). Journal of Moral Education. 31 (2): 101–119. doi:10.1080/0305724022014322. ↑ Bandura, Albert; Barbaranelli, Claudio; Caprara, Gian Vittorio; Pastorelli, Concetta (1996). "Mechanisms of moral disengagement in the exercise of moral agency." (PDF). Journal of Personality and Social Psychology. 71 (2): 364–374. doi:10.1037/0022-3514.71.2.364. ↑ Bandura, Albert; Underwood, Bill; Fromson, Michael E (1975). "Disinhibition of aggression through diffusion of responsibility and dehumanization of victims" (PDF). Journal of Research in Personality. 9 (4): 253–269. doi:10.1016/0092-6566(75)90001-X. ↑ Heberlein, AS (Sep 16, 2004). "Cortical regions for judgments of emotions and personality traits from point-light walkers". J Cogn Neurosci. Princeton University. 16 (7): 1143–58. doi:10.1162/0898929041920423. PMID 15453970. ↑ Kwan, VSY (2008). "Missing links in social cognition: The continuum from nonhuman agents to dehumanized humans". Social Cognition. 26 (2): 125–128. doi:10.1521/soco.2008.26.2.125. ↑ Fiske, ST (June 2002). "A model of (often mixed) stereotype content: competence and warmth respectively follow from perceived status and competition". NCBI. 82 (6): 878–902. doi:10.1037/0022-3514.82.6.878. PMID 12051578. ↑ Fiske, ST (Feb 11, 2007). "Universal dimensions of social cognition: warmth and competence". Trends Cogn Sci. 11 (2): 77–83. doi:10.1016/j.tics.2006.11.005. PMID 17188552. ↑ Amodio, David M.; Frith, Chris D. (2006-04-01). "Meeting of minds: the medial frontal cortex and social cognition". Nature Reviews. Neuroscience. 7 (4): 268–277. doi:10.1038/nrn1884. ISSN 1471-003X. PMID 16552413. ↑ Harris, Lasana T.; Fiske, Susan T. (2006-10-01). "Dehumanizing the lowest of the low: neuroimaging responses to extreme out-groups". Psychological Science. 17 (10): 847–853. doi:10.1111/j.1467-9280.2006.01793.x. ISSN 0956-7976. PMID 17100784. ↑ Frith, Chris D.; Frith, Uta (2007-08-21). "Social cognition in humans". Current Biology. 17 (16): R724–732. doi:10.1016/j.cub.2007.05.068. ISSN 0960-9822. PMID 17714666. ↑ Harris, Lasana T.; Fiske, Susan T. (2007-03-01). "Social groups that elicit disgust are differentially processed in mPFC". Social Cognitive and Affective Neuroscience. 2 (1): 45–51. doi:10.1093/scan/nsl037. ISSN 1749-5024. PMC 2555430 . PMID 18985118. ↑ Harris, Lasana T.; McClure, Samuel M.; van den Bos, Wouter; Cohen, Jonathan D.; Fiske, Susan T. (2007-12-01). "Regions of the MPFC differentially tuned to social and nonsocial affective evaluation". Cognitive, Affective & Behavioral Neuroscience. 7 (4): 309–316. doi:10.3758/cabn.7.4.309. ISSN 1530-7026. PMID 18189004. ↑ Capozza, D.; Andrighetto, L.; Di Bernardo, G. A.; Falvo, R. (2011). "Does status affect intergroup perceptions of humanity?". Group Processes & Intergroup Relations. 15 (3): 363–377. doi:10.1177/1368430211426733. ↑ Loughnan, S.; Haslam, N.; Kashima, Y. (2009). "Understanding the Relationship between Attribute-Based and Metaphor-Based Dehumanization". Group Processes & Intergroup Relations. 12 (6): 747–762. doi:10.1177/1368430209347726. ↑ Gruenfeld, Deborah H.; Inesi, M. Ena; Magee, Joe C.; Galinsky, Adam D. (2008). "Power and the objectification of social targets.". Journal of Personality and Social Psychology. 95 (1): 111–127. doi:10.1037/0022-3514.95.1.111. PMID 18605855. ↑ Waytz, Adam; Epley, Nicholas (2012). "Social connection enables dehumanization". Journal of Experimental Social Psychology. 48 (1): 70–76. doi:10.1016/j.jesp.2011.07.012. ↑ Harris, L. T.; Fiske, S. T. (2006). "Dehumanizing the Lowest of the Low: Neuroimaging Responses to Extreme Out-Groups" (PDF). Psychological Science. 17 (10): 847–853. doi:10.1111/j.1467-9280.2006.01793.x. PMID 17100784. ↑ Harris, L. T.; Fiske, S. T. (2007). "Social groups that elicit disgust are differentially processed in mPFC". Social Cognitive and Affective Neuroscience. 2 (1): 45–51. doi:10.1093/scan/nsl037. PMC 2555430 . PMID 18985118. ↑ Goff, Phillip Atiba; Eberhardt, Jennifer L.; Williams, Melissa J.; Jackson, Matthew Christian (2008). "Not yet human: Implicit knowledge, historical dehumanization, and contemporary consequences.". Journal of Personality and Social Psychology. 94 (2): 292–306. doi:10.1037/0022-3514.94.2.292. PMID 18211178. ↑ O'Brien, Gerald (2003). "Indigestible Food, Conquering Hordes, and Waste Materials: Metaphors of Immigrants and the Early Immigration Restriction Debate in the United States" (PDF). Metaphor and Symbol. 18 (1): 33–47. doi:10.1207/S15327868MS1801_3. ↑ "About the 1967 Referendum" (PDF). Victorian Curriculum and Assessment Authority. 2012. Retrieved 7 May 2016. ↑ Fredrickson, Barbara L.; Roberts, Tomi-Ann (1997). "OBJECTIFICATION THEORY.". Psychology of Women Quarterly. 21 (2): 173–206. doi:10.1111/j.1471-6402.1997.tb00108.x. ↑ Gervais, Sarah J.; Vescio, Theresa K.; Förster, Jens; Maass, Anne; Suitner, Caterina (2012). "Seeing women as objects: The sexual body part recognition bias". European Journal of Social Psychology. 42 (6): 743–753. doi:10.1002/ejsp.1890. ↑ Rudman, L. A.; Mescher, K. (2012). "Of Animals and Objects: Men's Implicit Dehumanization of Women and Likelihood of Sexual Aggression" (PDF). Personality and Social Psychology Bulletin. 38 (6): 734–746. doi:10.1177/0146167212436401. PMID 22374225. ↑ Montagu, Ashley and Matson, Floyd W. (1983) The dehumanization of man, McGraw-Hill, Preface, p. xi, "For that reason this sickness of the soul might well be called the 'Fifth Horseman of the Apocalypse.' Its more conventional name, of course, is dehumanization." ↑ Graham, Stephen (2006). "Cities and the 'War on Terror'". International Journal of Urban and Regional Research. 30 (2): 255–276. doi:10.1111/j.1468-2427.2006.00665.x. ↑ Ellawala, Themal.I (2016). "Pulling the trigger: Dehumanization of African Americans and Police Violence". Scholarly Undergraduate Research Journal. Clark. 2 (1): 1. ↑ Males, Mike (26 August 2014). "Who are Police killing?". Center on Juvenile and Criminal Justice. ↑ Goff, Phillip Atiba; Jackson, Matthew Christian; Di Leone, Brooke Allison Lewis; Culottal, Carmen Marie; Di Tomasso, Natalia Ann (2014). "The essence of innocence: Consequences of dehumanizing Black children". Personality and social psychology. 106 (4): 526–545. doi:10.1037/a0035663. ↑ Hartney, Christopher; Silva, Fabiana (1 January 2007). "And Justice for Some: Differential Treatment of Youth of Color in the Justice System" (PDF). National Council on Crime and Delinquency. ↑ Kelman, Herbert (1973). "Violence without moral restraint: Reflections on the dehumanization of victims and victimizers" (PDF). Journal of Social Issues. Harvard University. 29 (4): 25–61. doi:10.1111/j.1540-4560.1973.tb00102.x. ↑ Schulman-Green, Dena (2003). "Coping mechanisms of physicians who routinely work with dying patients". OMEGA: the Journal of Death and Dying. 47 (3): 253–264. doi:10.2190/950H-U076-T5JB-X6HN. ↑ Haque, O. S.; Waytz, A. (2012). "Dehumanization in Medicine: Causes, Solutions, and Functions". Perspectives on Psychological Science. 7 (2): 176–186. doi:10.1177/1745691611429706. PMID 26168442. ↑ Sanger, C (2008). "Seeing and believing: Mandatory ultrasound and the path to a protected choice". UCLA Law Review. 56: 351–408. ↑ Turner, Y., & Hadas-Halpern, I. (2008, December 3). "The effects of including a patient's photograph to the radiographic examination". Paper presented at Radiological Society of North America, Chicago, IL. ↑ Waytz, A.; Epley, N.; Cacioppo, J. T. (2010). "Social Cognition Unbound: Insights Into Anthropomorphism and Dehumanization" (PDF). Current Directions in Psychological Science. 19 (1): 58–62. doi:10.1177/0963721409359302. PMID 24839358. ↑ Bastian, Brock; Jetten, Jolanda; Radke, Helena R.M. (2012). "Cyber-dehumanization: Violent video game play diminishes our humanity". Journal of Experimental Social Psychology. 48 (2): 486–491. doi:10.1016/j.jesp.2011.10.009. ↑ Newkirk, Pamela. "The man who was caged in a zoo | Pamela Newkirk". the Guardian. Retrieved 2015-12-08. ↑ "AMERICAN INDIANS DEHUMANIZED BY DEMONIZING PROPAGANDA". www.danielnpaul.com. Retrieved 2015-12-08. ↑ Screaming Queens: The Riot at Compton’s Cafeteria. Dir. Susan Stryker and Victor Silverman, 2005. ↑ Koutonin, Mawuna Remarque. "Why are white people expats when the rest of us are immigrants?". the Guardian. Retrieved 2015-12-08. ↑ Fasoli, Fabio; Paladino, Maria Paola; Carnaghi, Andrea; Jetten, Jolanda; Bastian, Brock; Bain, Paul G. (2015-01-01). "Not "just words": Exposure to homophobic epithets leads to dehumanizing and physical distancing from gay men". European Journal of Social Psychology. 46 (2): n/a–n/a. doi:10.1002/ejsp.2148. ISSN 1099-0992. ↑ Anderson, Emma (2013). The Death and Afterlife of the North American Martyrs. United States: Harvard University Press. p. 91. ISBN 9780674726161.